Finally the wait is over, 2016 means ten years of DELAIN - and therefore ten years of larger-than-life symphonic metal. The band's latest EP "Lunar Prelude" was a tasty treat earlier this year, but haven`t we all been waiting for the main course? 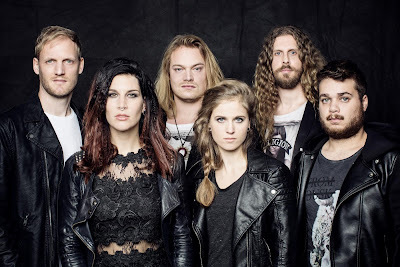 DELAIN fans have been clamoring to hear another new song from Moonbathers and today they are able to do just that. The new single "Fire With Fire" is streaming exclusively via Loudwire. The lyric video for "The Glory And The Scum" can be viewed HERE. Moonbathers, mastered by Grammy award winning Ted Jensen, will satiate your hunger for the symphonic greatness, catchy hooks and a solid dose of metal that the band is known for. It showcases DELAIN from both their most extravagant and sensitive sides as they explore all things nocturnal through an especially varied set of tracks including a surprising cover of classic rock legends Queen as well as a reappearance of Alissa White-Gluz as a special guest on opening track "Hands Of Gold". With ten years, touring the world with acts such as Sabaton, Nightwish or Within Temptation, two EP's and now their fifth full length album under their belt, 2016 will undoubtedly prove to be the biggest year for DELAINso far!